John is the founder of Credo and a freelance growth marketing and SEO consultant based in beautiful Denver, Colorado when he is not traveling. 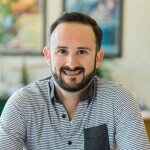 With almost a decade of of digital marketing experience, John has worn many hats and seen many things at companies that both help them succeed in big ways and also keep them from succeeding. It is now his passion to not only grow companies through great online marketing but also to coach companies through times of transition so that they are set up for success in the future. John directly managed 7 team members in this role, spanning SEO, email, content, PR, and link acquisition. Worked with engineers at Trulia Rentals to execute on SEO best practices and directly managed the marketer in charge of both marketing and transactional emails. John is the founder of Credo and a digital marketing consultant for hire. On a personal note, he is married to Courtney, is co-owner of a very large black lab named Butterbean, and enjoys adventuring throughout the nation and world to partake in rock climbing, cycling, and many other sports. I’ve been working with John for the last 18 months after we were introduced by a mutual colleague whos deep SEO knowledge I respect. I’ve worked with a handful of talented (and some not so talented) consultants in this space since 2011, and after speaking with a half-dozen more when we were looking to onboard someone new to tackle some hairy projects, I can confidently say John is the best I’ve come across. He has extensive experience running and advising SEO programs at companies with complex organic search challenges like Autodesk. Beyond domain expertise, John is incredibly responsive and easy to work with. Even though has been a consultant for us, he quickly became a trusted part of our team. His biggest strength might be his ability to successfully work with various groups across the company, from highly technical to nontechnical, and explain complex SEO concepts in a manner that all can understand and align around. The bottom line is that John is a great guy to have on your side. I've been working with John to improve my marketing efforts for Adopted.com. He did a deep analysis of our current strategy, and then offered a great plan to improve our site structure and more, followed by some high level recommendations for ongoing help to manage our marketing. Highly recommend him! John was fantastic to speak with and offered some great advice on a potential SEO strategy and our company direction. He really knows what he's talking about and it was a pleasure. Highly recommend.